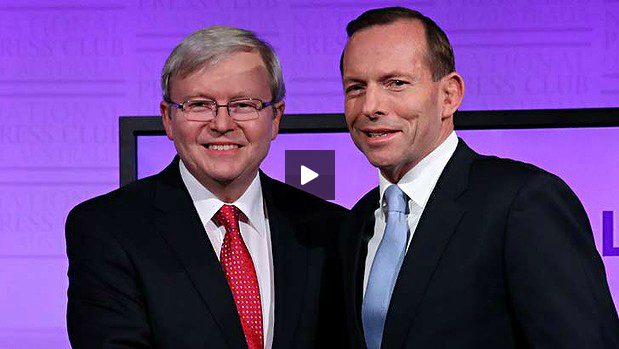 The first and possibly only leaders’ debate between Kevin Rudd and Tony Abbott concluded with no new major policy announcements. One of the substantial statements came from Kevin Rudd whom promised to legislate for marriage equality within 100 days if elected. Opposition leader Tony Abbott also hit back at claims that the Coalition is planning to change the GST by giving a direct ‘no’ looking straight into the camera. 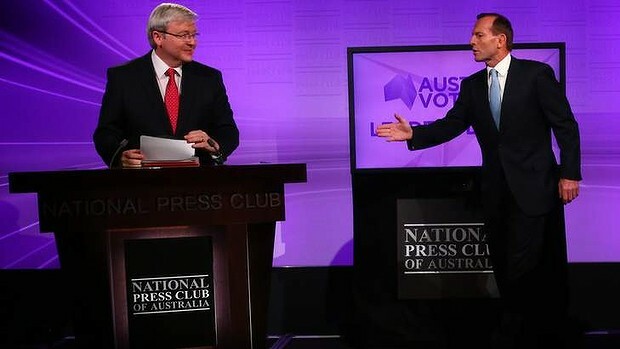 Kevin Rudd’s office subsequently denied that the Prime Minister had deliberately breached Press Gallery rules of not bringing prepared notes into the debate. The Liberal party has seized on Mr Rudd’s misunderstanding of the rules stating that if the election is based on trust, then the PM is a cheater. The major issue in the debate was the economy with both leaders trying to promote their economic management policies as being responsible and effective. With Kevin Rudd pressing Tony Abbott on the Coalition’s plans for the GST, Mr Abbott returned fire claiming that this was a part of the Labor scare campaign and that the GST would not change. The opposition said his plan of investing in Australian infrastructure including motorways and a revised version of the National Broadband Network would help the Australian economy. Under the Coalition, the School Kids Bonus would be cut as part of $17 billion dollars worth of savings that have been criticised as unfunded by Kevin Rudd. The Prime Minister held his ground when the issue of the failed home insulation scheme was raised by Tony Abbot instead pointing to the fact that Labor had kept interests rates low, had abolished Work Choices, had introduced DisabilityCare and the NBN as some its major achievements.